As the day winds down, I was trying to come up with a novel way to mark Cinco de Mayo this year. 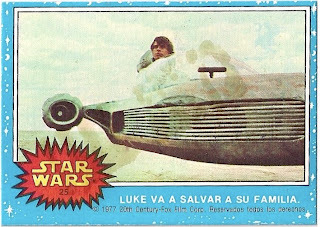 How about a little 1977 Topps Mexican Star Wars action? How about another margarita in the cantina, Luke? Yeah, he doesn't like you, either. 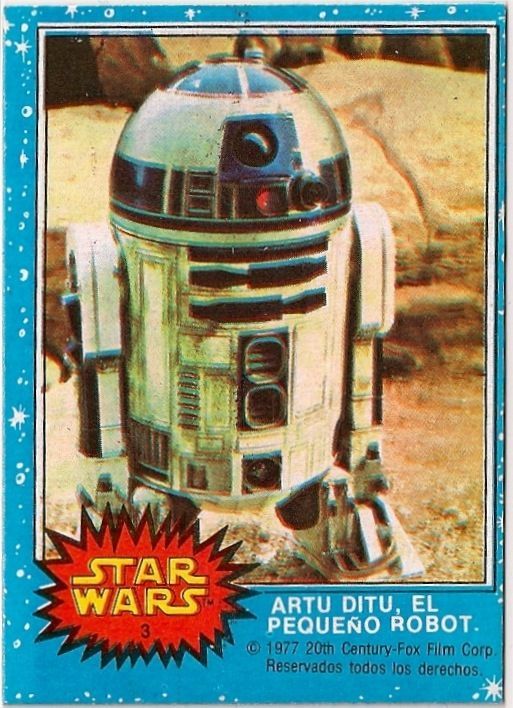 Too bad about the droids. They don't serve their kind there. So, I just made it in under the wire. If I waited one more month, it would be the third year anniversary of solitude for this blog's first and only blog post, still waiting for another. Looks like that anniversary won't be happening. Probably a good thing, I guess. I've been wanting to join dayf's Heritage Blaster Fantasy League for a few days now. I finally got the time and excuse to go to Target with my wife last night. We have something of an arrangement; if I want to purchase sports cards (or anything in a similar frivolous category), I also have to buy whatever it is that we (or she) need(s) from the retail palace. So, up I go to the checkout counter. In one hand, a Heritage blaster. The other? A box of what our nickname for it is: "fem-pro". With my humility properly placed in its winsome, swaddling nest, we then proceeded home. Managing some patience, I wait until today to crack open the blaster. The results of the box break, and my own resultant Heritage Blaster Fantasy Team will wait until the next post. I expect that post will happen much, much sooner this next time. I have something else to write about first--a tragedy. This post is about the Baseball Card of the Greatest Affrontery Evar. It just so happens to come from the blaster of 2010 Topps Heritage that I just opened. Let me think for a minute. Why is this card so bad? 1) I can't see a damn thing on the field that this card is supposedly commemorating. The only thing that stands out are the umpires. Yep, one, two, three...and...four little black ants. 2) Is this photo even of the All-Star Game? Is it even from 1961? Is that Miller even on the mound? As far as I know, this could just be a Giants - Phillies game from August of 1960. Or 1959. Or almost whenever. At least it is. Candlestick. So, literally speaking, Topps is in the ballpark. At least the photo is certifiably before 1971, as the stadium outfield perimeter wasn't enclosed yet. 3) The lamely colorized photo gives the guys lavender fedoras in the foreground, and an odd-looking pinkish mold tint in the stadium background. 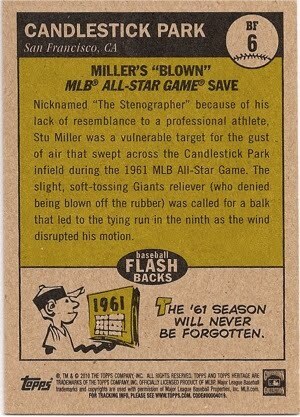 If the event is Stu Miller's "blown off the mound" urban tale, why did we get this image? Why not something more approriate, like, well, Stu? Or an image from the game? 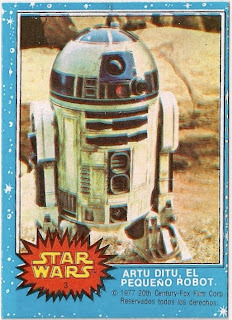 Topps, you have an exclusive license, it's not like using a fifty year old All-Star Game photo would have broken the bank. Besides, with a history of finding any excuse to put Mantle, Clemente, or Mays on about every fifth card, what happened here? 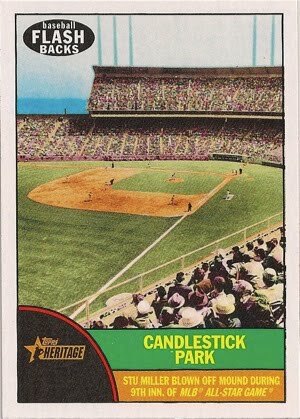 At least I get what occurred at the event, but the image on the front is almost completely irrelevant, other than yes, it is Candlestick Park, somewhere between 1958 and 1971 (and judging from the fashions, prior to sometime before 1965). However, the back of the card manages a total fail with the cartoon. "The '61 season will never be forgotten." What? How trite and lazy is that? That's not even saying anything! That's like saying, "You will never forget your first romantic prison encounter." I've already forgotten the 2003 season, or the 1996 season, so why wouldn't I forget it? Beyond me, though, seriously, will any MLB season ever be close to being lost to the sands of time? I doubt if any sport gets more mileage out of micro-analysis of its history than the MLB. Sabermetricians will be figuring out whether Maris or Mantle had the greater BLORP or SPAZ or TRAMP in 1961 long after I'm dead. The only thing forgotten here, is the acquisition of a compelling photo from the 1961 All-Star Game, from this apparently unforgettable season. 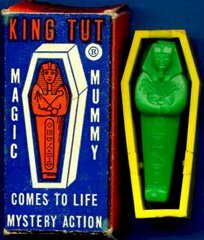 All in all, though, the funny thing about this legend is that every retelling makes it sound like ol' Stu was whisked away over the stadium wall, just like hot dog napkins I would release like a butterfly at Giants games when I was a kid. The actual notability of it, as the back at least suggests, is that Stu was penalized, maybe unfairly, for committing a balk because a typical Candlestick gust pushed him aside a couple of feet, and disputably off the rubber. I wish I could be around for the 2059 Topps Heritage set, and see the "Toad Eats Flies for the Loss in 2007 ALDS" flashback card.